Hello! I’m Masami Ueda, a music composer at PlatinumGames, here to write about some of my work on NieR:Automata. 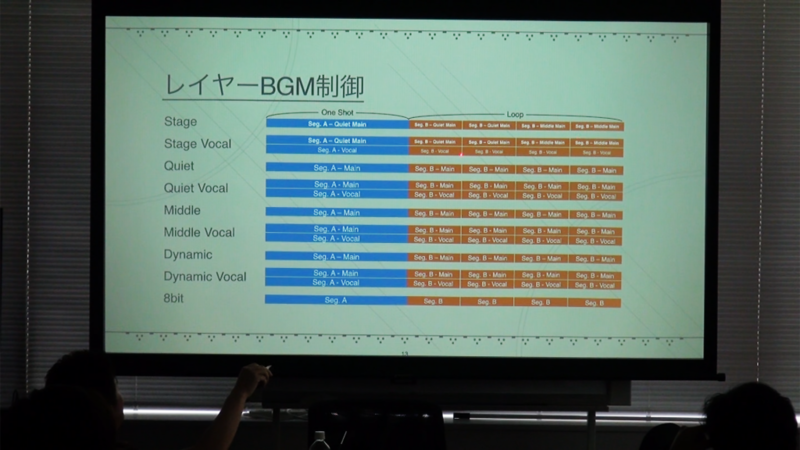 I didn’t compose the music for NieR:Automata, but I did implement it – that means I was in charge of the technical side of how you experience the background music in-game. We’re tremendously proud to be nominated for such a distinguished award. Of course we were able to achieve this honor thanks in a large part to Keiichi Okabe’s wonderful score and YOKO TARO’s fantastic direction! Today I’m writing about one part of NieR:Automata’s music implementation that took a special amount of care. At a recent audio team meeting, I was surprised to hear the way the music was handled in the hacking sections get the warmest reception. With that in mind, I’d like to focus on that implementation to give you a behind-the-scenes look at my work. Whenever 9S hacks into one of the enemies or chests in NieR:Automata, the background music morphs into an distinctive electronic version, like you might hear in an 8-bit game. Now, we hadn’t planned on making 8-bit versions of the score at first. However, inspired by the “Legend of Nier: 8-Bit Heroes” track on the “NIER Gestalt & Replicant: 15 Nightmares & Arrange Tracks” soundtrack from the original game, I suggested using 8-bit sounds in the hacking scenes. 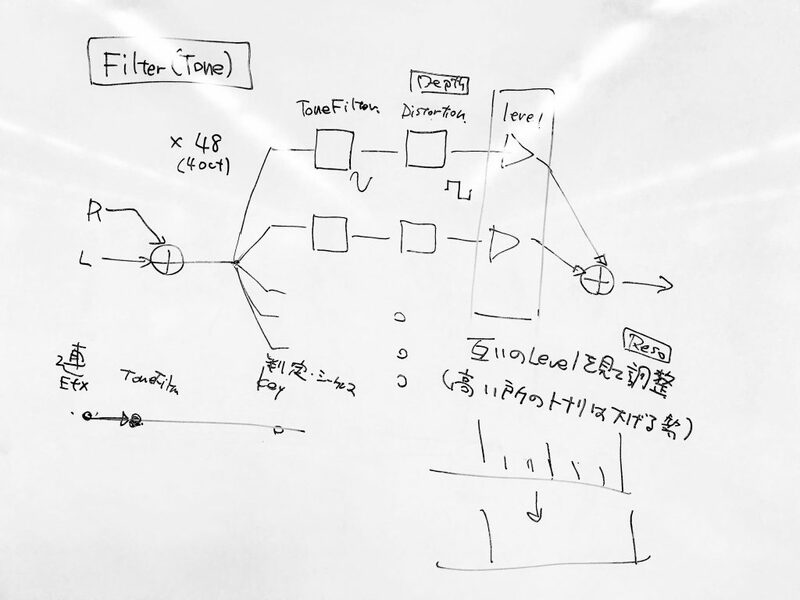 It seemed like a great opportunity to make use of an effect called a Tone Filter, which I had given a presentation on at CEDEC 2015. This is a straight transition into the 8-bit version of this piece of music, without the tone filter applied. Once 9S has successfully hacked into the enemy, the music crossfades into the 8-bit “hacking” version. This already sounds pretty good, but there’s still room for improvement. Now we’ve added a transition using the tone filter, which starts fading in once 9S starts hacking. This softens the switch over to 8-bit, which adds to the impression that 9S is trying to hack, but doesn’t know whether he’ll succeed. It also makes for a nicer connection to the 8-bit version when the hack is successful. What if there’s no 8-bit version? I’m sure you’ll agree that it lacks something when the filtered version is all you hear. We felt that it sounded best with the filtered version at 80% with a bit of a stereo delay. All things considered, there’s a lot about music processing that’s pretty difficult to get across in writing. But one thing that’s certainly true is that it takes a lot of small improvements, tweaked and tested and built up, to create a quality musical experience. Of course we put a lot of care and attention into other aspects of NieR:Automata’s sound implementation, too… but those will have to wait for another time! Masami Ueda has composed music since before PlatinumGames’ earliest days, working at Capcom, Clover Studio and SEEDS. You can hear his work in a wide variety of beloved titles, such as Resident Evil 1, 2 and 3; Devil May Cry; Viewtiful Joe 1 and 2; Okami; and Bayonetta 1 and 2. Beyond composing music, he strives to push the boundaries of game audio. He was the audio director and implementer on Transformers: Devastation and Teenage Mutant Ninja Turtles: Mutants in Manhattan. His most recent work is the sound implementation for NieR:Automata.